Convenient measuring and stirring of EM chemicals, pours without dripping, a disposable alternative to your laboratory glassware. Polypropylene Tri-Stir® Disposable Beakers are graduated, stackable, disposable, sterilizable and have three shallow dripless pouring spouts. The Tri-Stir® Disposable Plastic Beaker is useful for EM/LM specimen preparation. The Tri-Stir® beakers are also called Tri-Pour and Tri-Corner beakers. Polypropylene Tri-Stir® Disposable Beakers have a service temperature up to 100°C (212°F). Write-on, wax impregnated cardboard caps for protection against spills while handling and carrying. These beakers are opaque, rigid, nonporous, smooth surfaced and resist all chemicals except molten alkali metals and fluorine. They are an efficient substitute for platinum and can withstand 260°C continuously or 300°C for short periods. They have flat bases suitable for heating on controlled electric hot plates. PTFE Beakers are excellent for use in the PELCO BioWave® Pro+ Microwave Processor. Polypropylene Beakers are nearly unbreakable. They are resistant to cleaning solutions and are ideal for use in ultrasonic cleaners. Polypropylene Beakers are microwave safe for use in the PELCO BioWave® Pro Microwave Processor. Easy pour lip and ml graduations. The perfect beaker for safe handling and pouring larger volumes of liquids and reagents. Polypropylene Beakers are nearly unbreakable, have molded ml. graduations, and drip free pour spouts. They are resistant to cleaning solutions and are ideal for use in ultrasonic cleaners. Polypropylene Beakers are microwave safe. General laboratory use. Stainless Steel Beakers are virtually unbreakable. They can be used with heavy and sharp objects and offer excellent resistance to solvents, weak acids and cleaning solutions. Can be used in ultrasonic cleaners. Beakers feature easy pour lip. Not graduated. Pyrex® Glass Beakers are the standard for general laboratory use and can be used in ultrasonic cleaners. Pyrex® glass has excellent resistance to solvents and most acids. Not for use with heavy or sharp objects. Beakers feature easy pour lip. Use Glass Microbeakers for liquid evaporation, micro sample weighing, sample collecting, and storage applications. Samples can be viewed visually or with stereo and low power microscopes in shallow Microbeakers. Also can be used as petri dish, micro container for any protocol or micro sample processing not requiring thermal shock resistance. Made of N51A low expansion borosilicate glass. Sizes 0.5 - 7.5ml. Sold in packages of 12. Aluminum rack holds six Microbeakers. Open bottom allows for microscope examination. Available in two sizes. Glass is the standard for general laboratory use and can be used in ultrasonic cleaners. Glass has excellent resistance to solvents and most acids. Graduated Cylinders feature hexagonal base for stability, bumper guard, pour spout and easy-read scale. Accuracy assured by Class A, ASTME E-1272 batch certification. Measuring cylinders are molded one-piece polypropylene. Raised, prominent graduations and excellent contact clarity make reading easy. Hexagonal base provides stability and tapered spout aids in pouring. Resistant to most lab chemicals and can be autoclaved. Sizes from 25ml to 250ml. 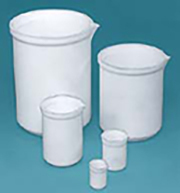 These polypropylene containers, with snap on lids, are specifically designed for the collection and transportation of various sizes of tissue samples. Available in 3 sizes. These economical white plastic spot dishes are suitable for most applications where glass or porcelain dishes are used. However, they are not recommended for strong solvents such as acetone or xylene. Made from white polystyrene, size 112 x 92mm with 12 wells of 22mm dia. and 6mm deep. Sold in package of 6.